First choose your overlay image and press Apply! To add a background for your animated gif, or to overlay your image with a funny animation is simple at the online image editor. First upload your image that you want to have as background. After that, press the Overlay button in the toolbar. A new upload box will be displayed. Choose the image from your computer you want to overlay with and press "Upload". Your uploaded animation will be displayed together with your background image. 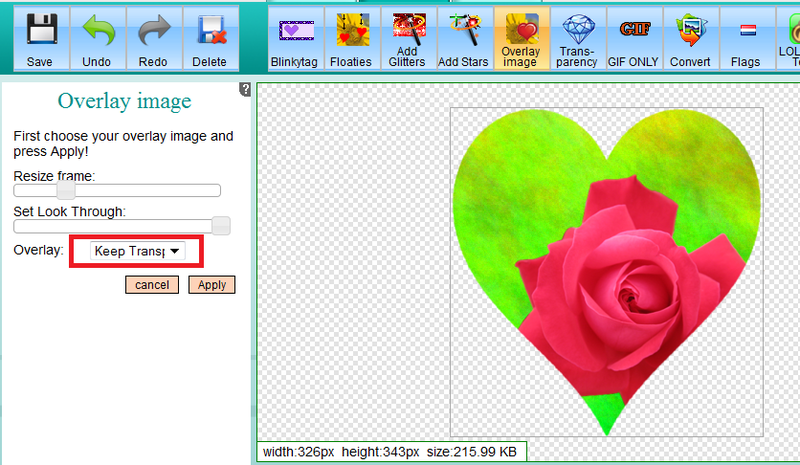 Now you can drag your overlay image to the desired position and press "Apply". *note: Opacity does not work when overlaying with an animated gif! 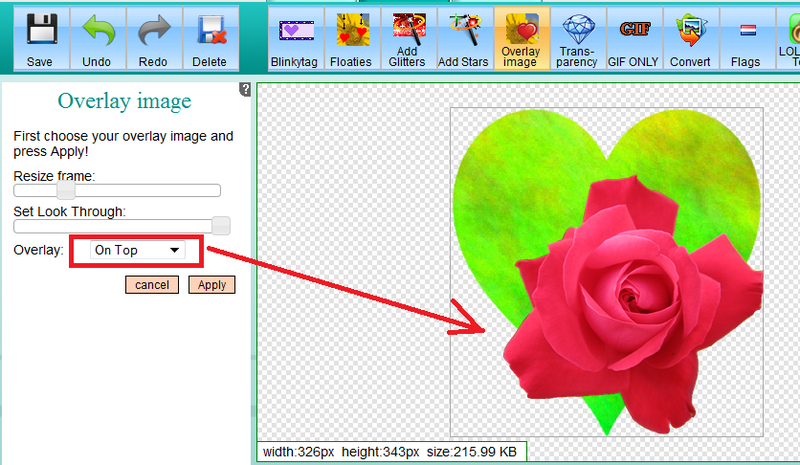 To add a watermark to your image use the opacity option in the toolbox. The higher the percentage of opacity, the more 'look-through' you create. See the examples below. There is an option to keep the transparency of the base image. So when you put your image on top, it will respect the transparent area. By default the image will be ON TOP of the other image. By choosing 'keep transparency', the overlay image will respect the base image transparent area. In the toolbar you can find a rotation slider. When moving the slider, your overlay image will rotate clock or anti-clockwise. Your animated gifs can also use the rotation function, how easy is that!